We’re bringing badge mailing to Anime Expo, which means there’s some new things to be aware of when it comes to registering for AX 2018. To help you out, we’ve created an in-depth guide to answer all your questions! Anime Expo will only ship 4-Day, 4-Day Child, 1-Day, Pre-Show, Premier Fan, and Artist Alley badges purchased between July 3rd, 2017 through 12:00 PM PT June 18th, 2018 within the United States and Canada. Badge mailing will start in early May 2018. Premier Fan badges will be mailed out early June 2018. Badges will not be re-shipped under any circumstances. There will be no exceptions. All orders will be mailed out to the 1st registrant’s shipping address. This includes orders with multiple registrants. The last day to change your shipping address is April 25th, 2018. Shipping fees includes shipping, handling, and badge activation. This is required for all badges and is non-refundable. 5/7/18 UPDATE: As of May 2018, Badge Mailing Has Begun! Badge mailing is done in batches. You will receive an email with tracking information once it has been mailed out. You can also check your Eventbrite account for updates and tracking information. The date when you purchased your badge(s) does not determine when it will be shipped. If you made separate purchases of multiple AX badges, then your badges will be shipped separately, according to each order. If you have questions or concerns regarding your shipment or mailing address, the original purchaser may email fulfillment@eventbrite.com. Only the original purchaser will be able to confirm the mailing address. Premier Fan and Artist Alley badges will be mailed out starting early June. International attendees, badge transfers from AX 2017, attendees who purchased badges after June 11, Press, Exhibitor, and Industry badge holders must pick up badges onsite. Each registrant must pick up his/her own badge. I bought my badge but moved to a different address. How do I update my shipping address? You can update your shipping address in your Eventbrite account by viewing “My Tickets” and clicking on the Pencil Icon that says “Edit” to input your new shipping address. The deadline to update your address is April 25th, 2018. How can I check my shipping address on Eventbrite to make sure it is correct? Contact fulfillment@eventbrite.com with your Eventbrite order number and valid shipping address. I am an international attendee, living outside the USA and Canada. How do I get my badge? For international attendees, you will need to pick up your badge Will Call counter in the Registration Assistance line. Please bring your order confirmation email (either a printout or digitally via a phone) and valid photo ID. Please see the map at the bottom of this page for to see where badge pick-up will be located. I do not want my badge to be mailed out to me, is there an option to pick it up at Will Call? The option to cancel shipment will become available on April 25th, 2018. This can be done through your Eventbrite account under the “Manage Wristband” tab. Shipping fees will not be refunded as it also includes badge activation and handling which is required for all badges. You will need to pick up your badge at the Badge Pick-Up line during Anime Expo. 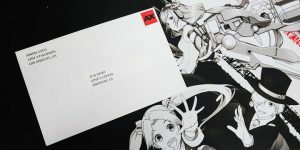 Bring your order confirmation email and valid photo ID at Anime Expo. Please see the map at the bottom of this page for to see where Will Call will be located. When will my badge be shipped? Where do I pick up my lanyard, swag bag, and program guide? You will be able to pick up your Anime Expo lanyard, swag bag, and program guide when you arrive on site as these items will not be shipped in advance. These items can be picked up on Figueroa St. by the South Hall Lobby entrance as early as July 3rd or 4th! Check the Hours & Maps page for more info. Please see the map at the bottom of this page for to see where bag/lanyard pick-up will be located. My badge was mailed but I did not receive it in the mail. What do I do? Go to “Manage Wristband” in your Eventbrite profile to view the status and tracking of your package. If the package says delivered, but you did not receive it, you will need to deactivate your badge on Eventbrite and go to the Registration Assistance line to pick up a replacement badge. Instructions to deactivate your badge can be found here. My badge was shipped to the wrong address, what I do? If your badge was shipped to the wrong address, you will need to deactivate your badge on Eventbrite and go to the Registration Assistance line to pick up a replacement. My badge tracking number says that it was returned to an address in Santa Ana, CA. What should I do? The return to sender address on your package is our office located in Santa Ana, CA. You will need to deactivate your badge on Eventbrite and go to the Registration Assistance line to pick up a replacement badge. You will not be able to pick up your badge at our Santa Ana, CA Office. I am buying a badge for a friend who lives abroad. Does their badge need to be picked on-site since they don’t live in the US or Canada? All badges will be shipped to the 1st Registrant’s shipping address. If it is a US or Canada address, all badges will be mailed out there. I am picking up my badge on-site, what do I need to bring? Upon arrival, bring your registration confirmation email and valid, government-issued photo ID. You may also use your smartphone to access your registration confirmation via the Eventbrite app. Please note our age restriction policy. Please see the map at the bottom of this page for to see where badge pick-up will be located. I am unable to attend Anime Expo 2018. How do I request a refund? Refund requests must follow our Refund and Transfer Policy. To submit the request, please email registration@anime-expo.org. I am an international attendee, and why am I still being charged shipping? The shipping fee also includes badge activation and handling cost. This fee is required for all badge purchases. I am an international attendee. Do I still need to input a shipping address even if you do not ship to international addresses? Yes, you should still input your international address in the order. How do I get a PDF version of my order to print? If you purchased your badge before June 11, 2018, 12:00 PM, you will not receive a PDF version of your order since your badge is being mailed. After the badge mailing cut-off date, attendees will receive PDF order confirmations which you will need to bring, along with a valid photo ID, to pick up your badge at the Badge Pick-up line. For international attendees, bring your order confirmation email and valid photo ID to pick up your badge at the Will Call counter in the Registration Assistance line. My badge was transferred from AX 2017, will I receive my badge in the mail? Please bring your PDF confirmation and go to the Badge Pick-Up Line during Anime Expo. Transferred badges are not mailed because the cost of 2017 badges does not include shipping and handling. All 2018 badges have an additional shipping/handling fee. Unfortunately, the Eventbrite system limitations do not allow shipping fees to be added on to the badges transferred from 2017. Which types of badges will not be shipped out? Press, Industry, Exhibitor, or transferred badges from 2017 will not be mailed. In addition, badges that are not purchased prior to the mailing cut-off date, June 11, 2018, at 12:00 PM, will not be mailed. These badges can be picked up at the appropriate registration line on-site. Please see the map at the bottom of this page for to see where professional badge pick-up will be located. When is the cutoff date for me to buy a badge and still have it shipped to me at my US/Canada address? The last day to purchase a badge and have it shipped out to you is June 11, 2018, at 12:00 PM. Badges purchased after this date will need to be picked up on-site at the Los Angeles Convention Center. Do have I have to use the same shipping address when registering for multiple badges in the same order? To prevent confusion, each registrant should have the same shipping address.